the area on the right. Tearing down the old to make room for the new has a long tradition in Naples. The Romans probably felt very progressive when they cleared away old Greek rock to make room for some real Roman masonry, and certainly, fifteen-hundred years later, the Spanish had good reason to be proud of themselves: they sundered ancient walls, built entire new quarters for the populace, extended the fortifications of the city up to Sant'Elmo, and built villa after villa along the western sea front of what would one day be the part of town known as Chiaia. All in all, they planned and brought off the renewal of the city on an impressively large scale. In the late 1800s, Naples was again ready for just such an urban transformation. Unfortunately, renewal of a city can be somewhat like cosmetic surgery on a person: the immediate results may be pleasing, but whether or not any real problems get solved is quite another question. 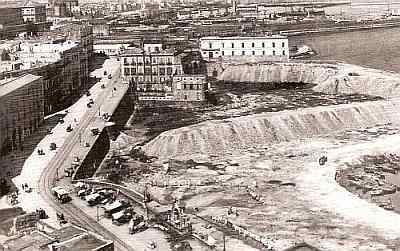 Today in Naples there is still great debate over the relative merits and faults of the massive rebuilding of the city which took place between 1889 and 1918. On January 15, 1885, the Italian legislature passed the Legge per il Risanamento di Napoli—the Law for the "Cleaning Up" of Naples. Here, risanamento means, literally, to "make healthy again." It was a law passed after more than a decade of thought given to the problem by urban planners, both local and national. The solution was to be of the so-called 'Haussmann' type, referring to Georges-Eugène Haussmann, the urban planner who had bull-dozed many of the slums of Paris a few years earlier in order to make room for the future. It was in keeping with other projects around the world at about the same time, plans that saw urban surgery as the only way to save the patient: go in and cut out the infected parts of the city. In many places, including Naples, this meant razing entire quarters of the city. First came the difficult expropriation process—clearing people off their property; then demolition; and, finally, reconstruction. Neapolitans referred to the process as sventramento—literally, "gutting." on via Nazario Sauro, all built on landfill (top photo). In order to understand what the risanamento accomplished or failed to accomplish, one has to understand the problems that faced the city at the time. Annexation of the Kingdom of Naples to the rest of Italy in 1860 (see Garibaldi) brought severe problems to the city of Naples. For centuries, the city had existed as the capital of a nation; it had been that nation's social, cultural and administrative hub. Naples, at the time of unification, was the largest center of services and administration in Italy. There is some justification for bureaucracy when it has something to do—and, indeed, Naples had a kingdom to take care of. However, when there is suddenly nothing left to run, society becomes much worse than just top-heavy with bureaucrats; it borders on collapse, or at least severe decay. 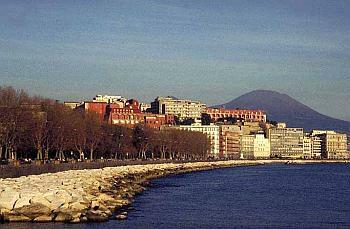 Naples was in that difficult position after the unification: it was an ex-capital with nothing to do. In order to assume some sort of a normal role as just another large Italian city, it would have needed an industrial and commercial base—it had none, or at least none that could compete effectively within a united Italy. It would also need an able administrative class on a regional level; yet, the ex-administrators of the Kingdom of Naples showed themselves particularly clumsy in making the transition. Additionally, Naples was beset by the inability, or unwillingness, on the part of its new boss, the central Italian government, to deal with the problems of the South. 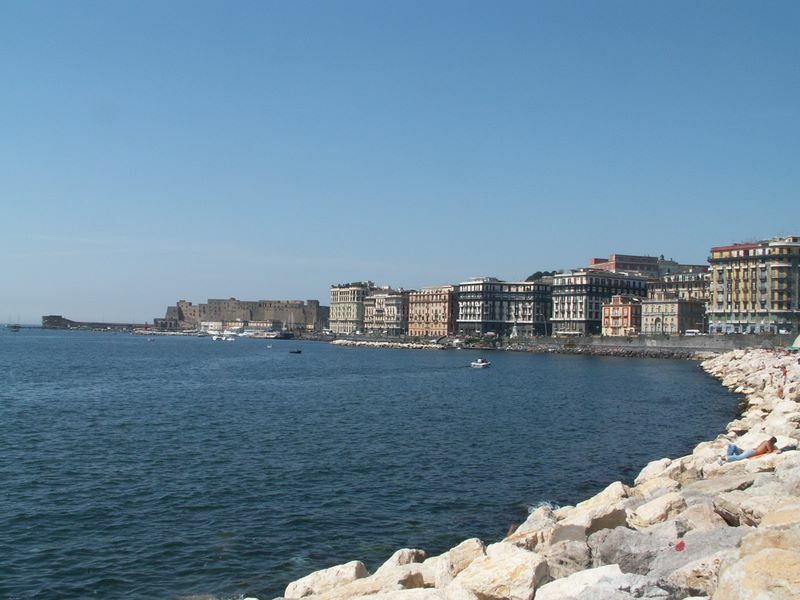 For a few years after unification, Naples seemed to move ahead simply on bureaucratic inertia. There were, after all, a number of municipal projects left over from the Bourbons which could and should still be finished. Thus, via Duomo was completed and opened to join the city center with the port; the splendid corso Maria Teresa (today corso Vittorio Emanuele) was finished to become one of the city's main east-west roads, winding along above the city, halfway up the slope of the Vomero hill; the Villa Comunale (the former Royal Garden) was expanded. There are many other smaller projects, as well, which were carried out in the first twenty years after unification. In a lighter vein, even the cable-car up the slopes of Mount Vesuvius was opened in 1880, giving us all the happy little tune, Funiculì, Funiculà, composed especially for the occasion. Yet, as Alfonso Scirocco points out in Storia di Napoli: "The good will of local civil servants simply wasn't enough to do the job." Here, "the job" meant a number of huge problems left outstanding when the Kingdom came to an end, but problems that the Bourbon rulers had long known they would have to be deal with if Naples was to prepare for the future. These problems now belonged to the new federal government. Among these were: the expansion of the port of Naples; the creation of new industry in what was essentially an agrarian society; the creation of new residential areas, chiefly in the areas of Posillipo and on the Vomero hill above the city; a transit system; and new roads to connect the main railway station to the rest of the city as well as to facilitate expansion to the east and west. A formidable list. Nicola Amore was elected mayor of Naples in 1884 and is generally viewed as having been a capable and honest administrator. His job was made very difficult by the outbreak of a cholera epidemic a few months after he took office. The disease claimed 7,000 victims and left the city emotionally devastated. Add to this the mass of literature written in the previous decade about "the Neapolitan Problem," (Jesse White Mario's The Poverty of Naples is a famous example among many) and by 1885 the city of Naples seemed to have become almost a caricature of social ills: It was squalid, ridden with disease and teeming with an underclass. It was a bleak picture and one which many felt could be brightened only by drastic means. It was clear to everyone that the risanamento would mean ripping Naples out of its past: monuments would be torn down, ancient popular sections of the city would be radically transformed, if not altogether done away with; and at least some priceless artistic treasures would be lost. In short, Naples would be "guillotined" into the future, to use the metaphor current among Neapolitan intellectuals of the late nineteenth century. Interestingly, the majority of these persons—the likes of Benedetto Croce—if not actually welcoming the coming ax, viewed the risanamento as necessary. Contrary views found little favor, except many years after the fact, views that voiced the concern that the Risanamento had been a quick fix and not rational urban renewal. The results of the risanamento are evident today. The broad boulevard named Corso Umberto—called by Neapolitans simply the rettifilo, the "straight line"—the road that passes through the downtown area from Piazza della Borsa to the train station is the most striking product of the risanamento. It was achieved by clearing a wide, mile-long swath through the middle of town. It got the job done, clearing the center of the city of terrible slums and improving transit through the city along the new route. On both sides of this broad boulevard, dozens and dozens of architectural children of the risanamento were born: new offices, shops and residences in high spacious buildings. Among these were the neoclassical main building of the University of Naples and the imaginative configuration of four identical buildings, called "the quadruplets" by Neapolitans, occupying the four corners of Piazza Nicola Amore. At the end of the rettifilo, the spacious Piazza Garibaldi was created and surrounded by new buildings. Further to the west, across from the San Carlo theater, the area known as Santa Brigida was transformed by the construction of the Galleria Umberto; the area between the opera house and Piazza Municipio was essentially reinvented by the presence of new buildings. Piazza Municipio (City Hall Square), itself—the spacious area between the port and the City Hall—came into being. In order to lay it out, five centuries of castle fortifications, walls, stables, barracks and just plain clutter had to be torn down. The entire section of Mergellina was transformed, as well, including the addition of the new via Caracciolo (photo, left), the spectacular seaside road reclaimed from the sea in front of the Villa Comunale. Additionally, the infamous bassi of Naples, vile cellar dwellings in the most densely populated areas of town—nests of disease—were cleaned up. Modern-day Naples is unimaginable without those changes wrought a century ago. From that point of view, then, the worst criticism of the risanamento—that it was a gigantic public works boondoggle—is unjustifiably harsh. The question is whether or not even massive surgery on a city like Naples really cut to the heart of the city's problems. For example, the new Corso Umberto cut the downtown area in half, separating the port area and the old Market Place from the rest of the city. Isolating the long wide stretch of property along the port left that area free to decay even further, something that clearly made the expansion of port facilities more difficult. Another example: The decision to put a steel mill in Bagnoli in 1904, thus ruining the ecology of what had been one of the most beautiful coastlines in the Mediterranean, was staggeringly wrong. It was part of a pattern of almost random urban sprawl that could not have been worse if it had been malevolently planned. The effects of this sprawl are quite evident today—Naples is overbuilt with structures put up illegally; in many cases, it is construction made easier by all those new roads. The risanamento is also interesting in that it failed to even undertake certain things that, at least in retrospect, it should have—such as a metropolitana, an underground rail mass transit system for the city. Architect Lamont Young's plan for just such a system now seems a brilliant one. It would have been given Naples one of the first subway train systems in the world; yet, it was not built, probably because it was part of a package deal to develop Mergellina and Bagnoli in ways that were viewed as being too quaint and Victorian at the time. Aside from quibbles over individual construction projects, the real question is whether any kind of building project can really solve some problems. The admittedly gratifying effect of a splendid new Gallery brought about no change, for example, in the insufficient industrial base; new office and shop space for the nascent white-collar class did not solve the problem of housing shortages and staggering unemployment among the blue-collar class; and, even worse, nothing was done about the absolutely no-collar underclass, the lumpenproletariat—not merely unemployed, but perhaps unemployable, possessing no skills to sell in the new century. The risanamento was officially ended by decree in 1918; yet, it had actually petered out some years earlier, affected by a variety of things. A report published at the turn of the century on the results of the first decade of the risanamento was discouraging. It came to the unhappy conclusion that something had already gone quite wrong; political infighting, rampant favoritism, camorra (the Neapolitan mafia) and corruption had made the campaign to remake Naples much less than it might have been. In any event the Risanamento closed to mixed reviews. It is a sad irony that the Risanamento of Naples coincided almost exactly with the period of greatest emigration away from Naples by the very persons who, at least on paper, were to have benefited from the rejuvenation of their city.